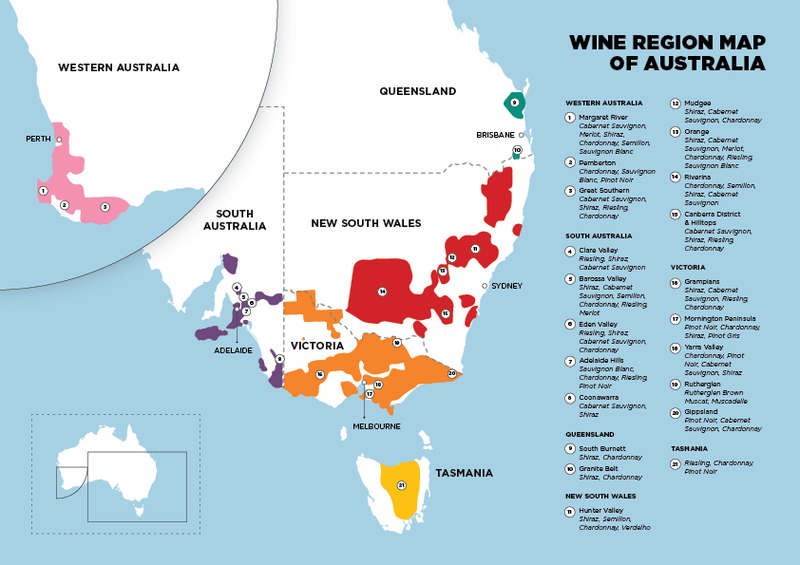 Australia has a well-known love of wine. Not just to be enjoyed in the evenings, you can plan a whole holiday around visiting Australia’s many incredible wine-producing regions. Expect stunning scenery, boutique accommodation and the perfect excuse to come home with a few cases. When you’re choosing where to visit, you really can’t go wrong. Each region has a special charm and a local specialty. The best part? Where there’s wine, there’s food. Everything you need for the perfect break. Top spots: TarraWarra Estate, Rochford Wines, Oakridge Wines, Yering Farm, Giant Steps. Just an hour from Melbourne, the Yarra Valley is one of the world’s top wine regions. The cool climate region is now home to over 80 cellar doors, all begging to be visited. These include some heavy hitters, like De Bortoli, Yering Station and even Domaine Chandon, which is Moet & Chandon's Australian winery. Fans of beer and cider are well looked after too so there’s something to please everyone! Don’t miss lunch and a glass or two at Innocent Bystander and then round out your day with a tipple at the Four Pillars Gin Distillery- wine isn’t all this region is known for! Learn more about visiting the Yarra Valley. Top spots: Jacob’s Creek, Turkey Flat Vineyards, St Hugo, Wolf Blass, Tearo Estate. With over 150 wineries to explore, you’ll need more than a weekend for the Barossa Valley. A long established area, the Barossa has a system for categorising vines by age with the Barossa Ancestor Vine clocking in at over 125 years in the Old Vine Charter. Don’t miss a visit to Seppeltsfield for a snifter of their 100-year old tawny port. Get to know the Barossa Valley. Top spots: Passel Estate, Leeuwin Estate, Cullen Wines, Brookwood Estate, Lenton Brae. The first commercial vineyard was established in just 1967, but incredibly the region already produces over 20% of Australia’s premium wine. Three hours south of Perth, the area has been described as the ‘rabbit warren’ of vineyards with over 95 cellar doors in the relatively small region. Don’t miss a visit to Vasse Felix, the area’s founding vineyard. Top spots: Ridgeview Wines, Tyrrell’s Wine, Tempus Two Cellar Door, Roche Estate, De Bortoli Wines. As Australia’s oldest wine region, the Hunter Valley is so well established, that you’ll find over 150 cellar doors to explore. If you’re there in August, you might catch the Hunter Valley Wine Show which celebrates the best of the region. Don’t miss a visit to Dalwood Estate the site of the original Wyndham Estate, Australia’s oldest vineyard. See more of the Hunter Valley. Top spots: Bay of Fires, Dalrymple Vineyards, Josef Chromy, Holm Oak Vineyards, Tamar Ridge. Another cool climate region, Tasmania’s north is home to the Tamar Valley, a haven for wine and produce. Base yourself in Launceston and come with an appetite! You’ll find over 30 cellar doors dotted across the 170km Tamar Valley Wine Route. Make sure to take advantage of the ‘Travel Lightly’ service which will send your bottles home. Simply present them at the last vineyard you stop at and pay the freight charge. Don’t miss a visit to the Jansz Tasmania Wine Room and the chance to experience their Méthode Tasmanoise sparkling wine. Explore the Tamar Valley Wine Route.